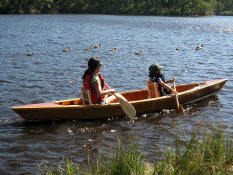 I grew up on the water and have been canoeing my entire life, that being said, I am familiar with all types of boats and canoes. 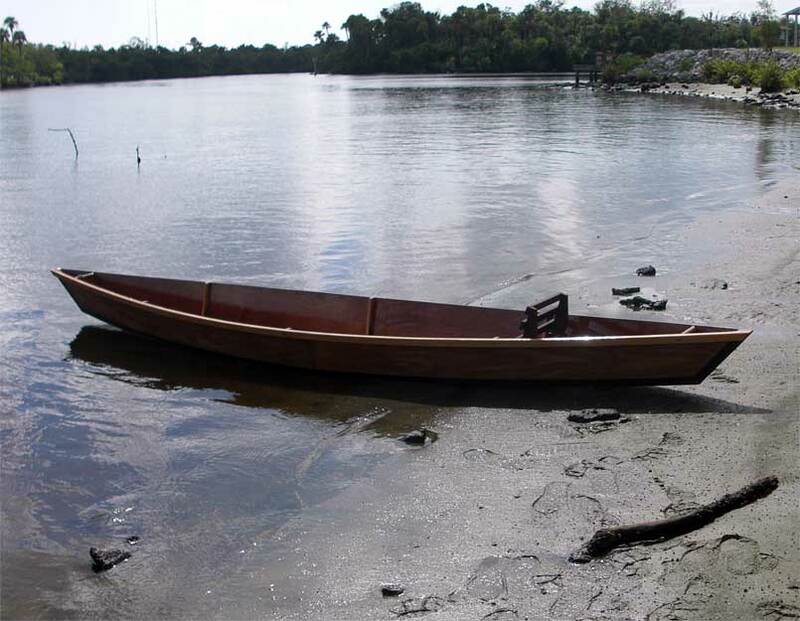 In this area the canoe is the go to boat for Pirogue type activities but this style Pirogue outclasses them all. 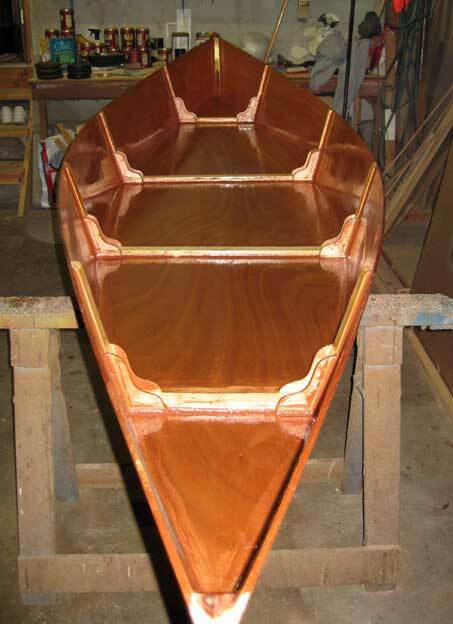 This is one great boat and worth the time and effort to build. I will be building another for my family, probably next spring. Contraband Days, a "pirate" themed festival, is one of Louisiana's largest festivals and the oldest festival for the City of Lake Charles. Celebrating its 55th year in 2012. 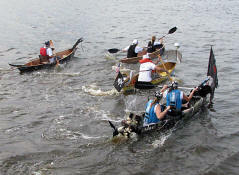 This year a build and race 'your' Cajun Pirogue competition was included. Before the day was over folks were signing up for next year. 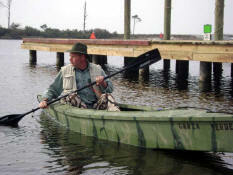 I purchased your pirogue plan in October 2010. It was completed in January 2011, took me about 80 hours all together to build (it was named Tintin after my son's favorite cartoon). It is my first boat. My eight year old son, Ringo, helped me a bit, but I did all by myself (Tintin is Ringo's boat) except for cutting the stems which my woodworker friend helped me. 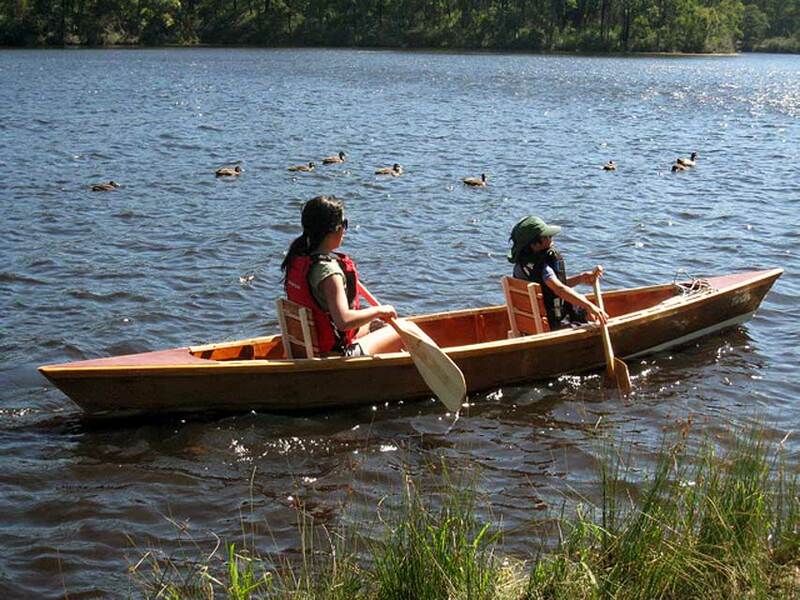 I haven't seen any other pirogue in Australia and may be mine is the first one here. Few self-build canoes here. Everyone around me says it is beautiful and I am happy I built it. I really have very little actual wood working experience. I observed the many boat builds that have been posted to your web site. While the basic elements seem to be the same it was clear that some of your builders incorporated interesting and very creative design into their projects. I studied these successful builds very carefully in order to learn what design elements could be adapted to my own boat. 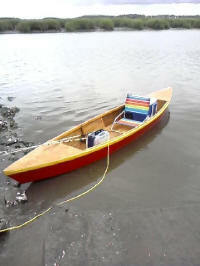 I really didn't want to send you pictures of a boat that did not contribute in a positive way to what many other guys have accomplished in their interpretations of what an "Uncle John's Cajun Pirogue" should look like. 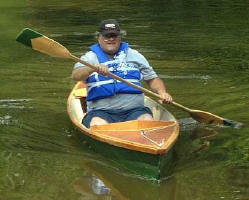 I took my pirogue to the Coalition of Historical Trekkers National Gathering at Fort Osage in MO just 2 weeks ago. I got so many really nice comments. Executive Director for the Historical Re-enactor's Guild. 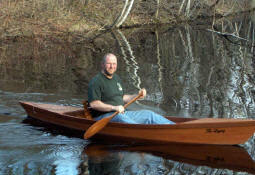 Jeff Taylor didn't send us any comments other than "The boat works great". But, he did send some great photos of his Pirogue. We always love to see how folks 'trick' out our design to make it their own. 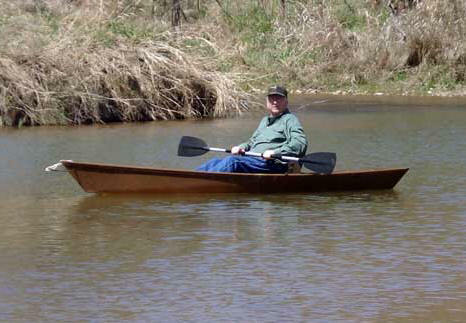 I have been using this boat for five years in the streams, rivers and bayous of Texas and Arkansas. I love it! I built it for research I do with the Texas Bigfoot Research Conservancy (www.texasbigfoot.org). I had the privilege of being on one of the MonsterQuest episodes on the History Channel entitled "The Swamp Stalker". 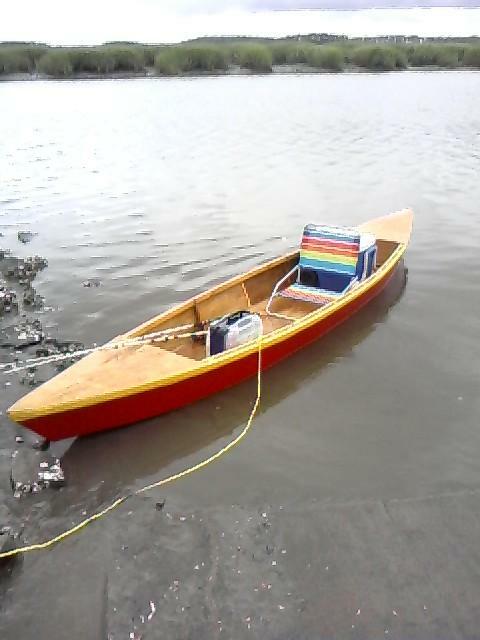 My completed pirogue built from your very good plans. She is 14' 3" with 1/4 inch sides and 3/8 bottom, weighing 55 lbs. The plywood was scarfed using your method and are quite strong. I fiberglassed 4 " up the inside and the entire 30 " wide bottom with 3.25 cloth. I did quite a bit of looking on the internet for plans and yours are by far the best. 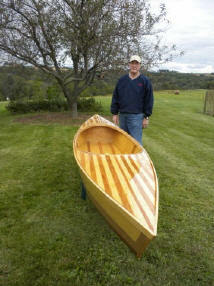 My father and I built the boat and had a great time. This is a great project that I recommend to anyone who wants to give it a try. We spent a lot of time trying to come up with the "ideal" dimensions for a duck hunting boat and applied two layers of cloth to the bottom front and back. We installed the handles and carrying thwart and used exterior paint with Cabelas grass and bark pattern overlay. A 96" kayak paddle is highly recommended. Thank you again for the well thought out plans and all the advice and support. I'm quite pleased with the results and look forward to building another one soon. acquired a digital camera shortly after gluing up the frames your kits provided and have been posting a half dozen or so a day on my Facebook page, You'll find, variously, photos of my deck layout, flooring grate, foredeck and splash guard/coaming, inwale detail (sisal rope), and an overview of the entire boat in the garage. (Click Here to visit Dan's Facebook page). I've paddled on the Connecticut River in Massachusetts, and the Haw River, lakes "Townsend" and "B. Everett Jordan" in North Carolina. I had a blast building it ! although I got jammed up a couple of times , I chaulked it up to inexperience and kept on truckin. I strayed from the plans a little. the bottom is 3/8 ex.plywood which has caused the boat to become a two man carry.The boat is actually a year old already and I'm still obsessed with it . I'm having a great time, thank you. 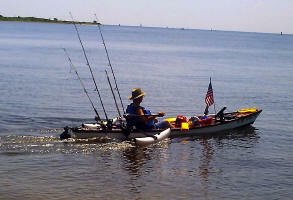 Gary sent us a great set of photos, click here to view his Pirogue. 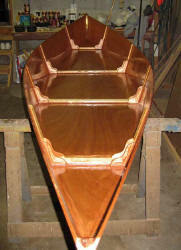 Just a short message to thank you and share a couple of photos of the 1st of 2 boats I am building. It was a very enjoyable build and I look forward to each time I can get in it and go explore the tidal creeks all around Savannah, Ga. 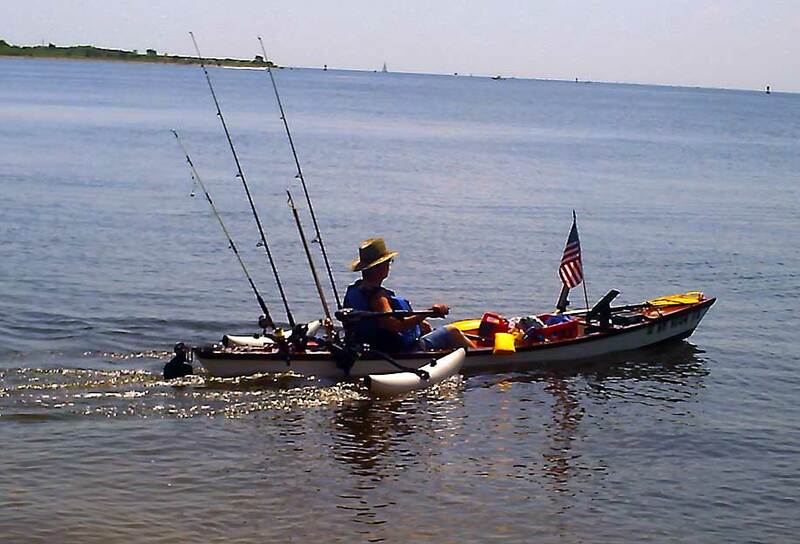 It is a perfect boat for my fishing needs. Now to get more time to go fishing more often!! Once again thanks and hope you enjoy the pics. 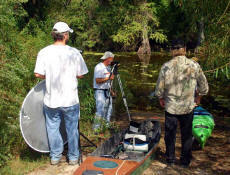 click here to check out Kelly's photo site. 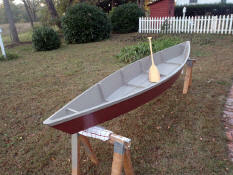 I built my pirogue over a week. The glassing was the biggest challenge. My boat is 12� - real short. It�s still stable. I weigh 200lbs and enjoy it on the river here in North Texas. Send us your photos so that we can include you.